According to statistics, one in three people will develop cancer at some point in their lives – although it currently feels a bit like a full three in three for me, with 2012 continuing to be the shittiest year on record for the health and well-being of my nearest and dearest. With that in mind, when I got an email from a nice man called Andrew at Macmillan Cancer Support telling me about their collaboration with Julie Verhoeven I was more than happy to mention it here. Having correctly noted that I was a Julie fangirl, Andrew went on to say that he knew this new collaboration wasn’t fashion related and that I could feel free to bin his email if it was of no interest. Andrew, dude, I will do everything in my powers to spread the word about the incredible work that Macmillan do. Especially when it includes Julie. The fashion illustrator has created a limited edition espresso cup and saucer to celebrate Macmillan’s World’s Biggest Coffee Morning, which takes place on Friday 28 September. The cups are on sale now for £40 (for two) from the Macmillan online shop with all proceeds helping to support people affected by cancer. Even more importantly, you should totally take part in the World’s Biggest Coffee morning – all you need to do is register then serve up coffee and cakes in your home/workplace/bedroom and ask your guests to contribute. No-one needs encouragement to eat cake, right? Particularly when it’s for such a good cause. Visit www.macmillan.org.uk/maketime, call 0845 602 1246, or text COFFEE to 88080 to get your Coffee Morning Kit. 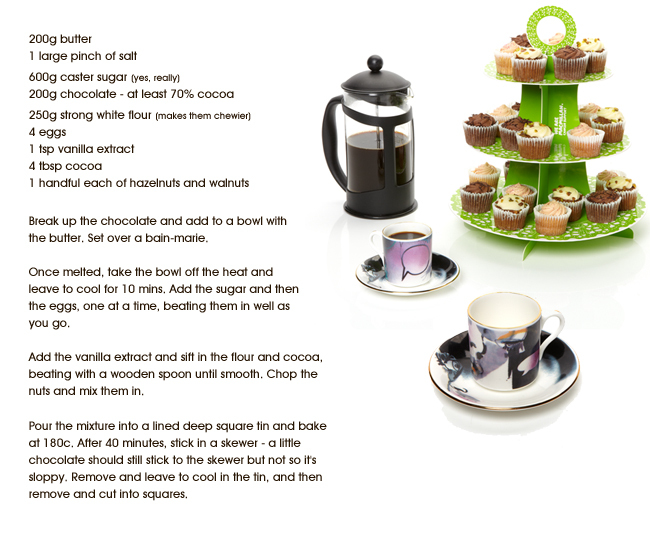 Oh and for good measure, here’s my favourite cake-y recipe – the best brownies on the planet, courtesy of Lizzie.